The only thing better in this world than getting one free bagel is getting two free bagels. 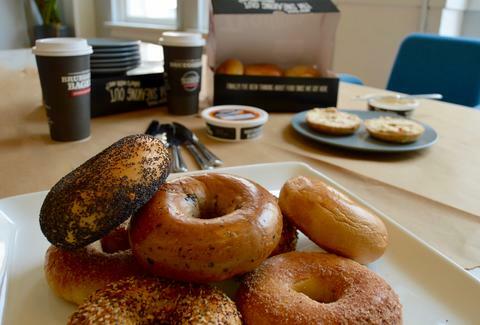 And the only thing better in this world than getting two free bagels is happening at Bruegger's everywhere next Thursday morning, because it's giving out three free bagels to anyone who walks in with a coupon. Here's how it works: First, sign up here to get the bagels. Then go to any Bruegger's Bagels (it's in 26 states and DC -- see if there's one near you) on Thursday, February 2 from open until 11am. Then share your bounty. Or, um, don't. The giveaway is happening to celebrate the chain's 34th anniversary. If only wedding anniversaries were celebrated with bagels, as that would be way better than the stupid opal anniversary. And if the giveaway gives you a hunger for free breakfast goodies, we found a way to get free bagels all the damn time. No coupon necessary! Lee Breslouer is a senior writer for Thrillist, and enjoys a bagel any time of day. Follow him to schmears @LeeBreslouer.